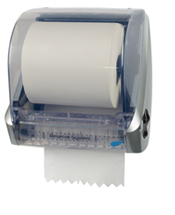 The Pod is a unique reserve roll auto cut paper hand towel dispenser that has one of the largest paper capacities on the market. 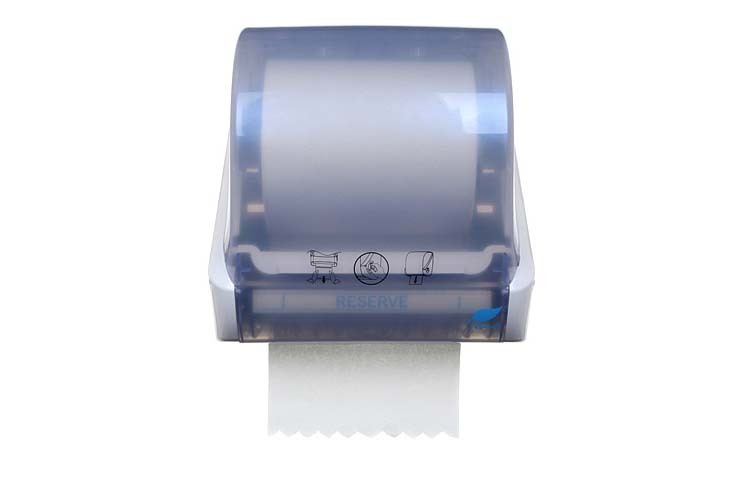 Thanks to its patented reserve roll loading system, a new roll can be loaded before the previous one has been fully used, thus making sure no paper is wasted. This reserve feature can save up to 20% of paper consumption*. The Pod is the most compact reserve paper hand towel dispenser available on the market and has been designed to accommodate a large variety of paper types: different lengths, 1 ply, 2 ply. With its sleek and contemporary design, a full transparent cover to allow quick paper level inspection, the Pod is an excellent choice for an efficient and stylish hand drying. The Pod is also available in a standard, single roll version. Please contact us if you would like us to verify the suitability of a particular paper roll or if you have a specific paper roll requirement that does not correspond to these limits. Standard 2-ply, 110-meter (120-yd) paper rolls are available.